We could tell you that using board software is the best way banks can ensure they’re making the most out of every board meeting. But that’s not exactly a hot take. Believe it or not, we may be a little biased. Instead, let’s take a closer look at what’s at stake when the technology banks use to manage their boards fails to meet their unique needs. Of course, we don’t know the unique needs of every bank. However, Directorpoint has helped bank boards across the country make more effective decisions. We know a thing or two. But if we’re going to gauge the needs and priorities of the financial sector, we’ll need a good dataset. In our last blog, we referred to a 2014 study from Deloitte which surveyed 250 board members working in various industries. The final question of their survey was asking board members to select three areas of focus they wanted to prioritize in the coming year. Take a look at the responses they received from directors on the boards of financial services institutions. What do these results tell us about the topics bank boards are prioritizing? 1. Bank boards value strategy and risk mitigation. This should come as no surprise. But from these findings, we learn that bank boards prioritize (1) the planning and decision-making that goes into “strategy”, and (2) the information, data, forecasting, and expert opinions involved in mitigating risk. 2. Despite valuing risk oversight, bank boards undervalue technology and cybersecurity. 3. Self-evaluation and training aren’t on boards’ radar. When Deloitte received their survey responses, four topics weren’t in anyone’s top three priorities. Two of those topics were Board Evaluations and Board Orientation and Training. This should worry you. Sure, it doesn’t reflect every board in the financial services industry. But it’s indicative of a trend; a thin sentiment lurking in the corner of boardrooms across the country. So let’s call it out. Let’s identify why this is a problem and what your board can do to fix it. We know that bank boards value strategy and risk oversight. We know that those top two priorities are heavily dependent on staying informed. Uninformed strategizing is called “guessing”. Risk oversight has a more complex reliance on good information. Not only do board members need to have the information required to assess risk, it has to be organized effectively enough to be useful. All it takes is one red flag — no matter how small — to go overlooked. To collect and organize the information involved in strategic planning, strategic decision-making, and risk oversight, you need technology. Simple as that. With technology comes cybersecurity, but protecting your data falls under risk oversight. As long as risk oversight is a top priority, cybersecurity should be taken care of. So that leaves “technology”. 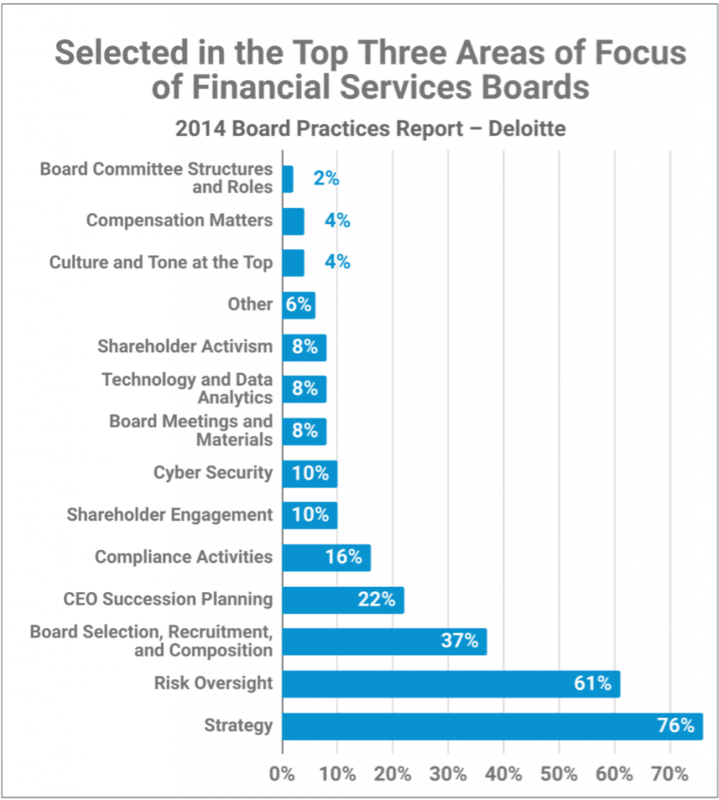 If strategy and risk oversight were listed as bank boards’ top priorities, we would expect to see technology listed at more than a paltry ten percent. We have a theory. Board software is many things to many boards. But it is, without question, technology. That word may scare some boards more than others. 58% of the financial services boards reported their youngest director as being above the age of 50. That’s a generation of people who didn’t grow up using software platforms. It’s not ingrained in their DNA. It makes sense, then, that the learning curve around using new technology likely starts a little higher. With a reported 66% of survey respondents within the financial services industry sitting on boards of ten or more members, introducing new technology begins to seem justifiably intimidating. Intimidating as it may be, if strategy and risk oversight remain a priority, the introduction of new technologies is necessary. Identifying that your board needs to take the digital leap begins with self-evaluation and assessment. If board evaluations aren’t a priority, that may never happen. Once the need has been identified, training must be a top priority for successful implementation. However, regardless of the learning curve; regardless of the quality of the training, the more technology is able to meet your needs, the more pressure is taken off of the implementation process. Having the right technology leaves you with a little room in case you do have a high learning curve to overcome or your training does fall short. We’re about to make the argument that, as far as governance and decision-making is concerned, a single board portal app is the only technology capable of meeting your needs. But first, let’s explain why some of the most popular alternatives are incapable of meeting those needs. In our last article, we discussed the burden of banks using enterprise communication apps to handle discussions and deliberations amongst their board members. This includes messaging apps such as Slack and conferencing solutions like WebEx or Skype. We’re not saying there’s anything wrong with these tools. They’re great; when they’re used for the right tasks. But these tools weren’t built with boards in mind. Because of this, board members are more likely to end up using two or three different tools, each fulfilling a fraction of their needs. Beyond that, integrating multiple software platforms — each developed by a different company — to provide a seamless experience for sharing documents, calendar events, and secured communications throws a very large wrench into the complex gears of successful implementation. By choosing board software whose features are divided up between multiple apps, bank boards force their directors to learn, navigate, and manage multiple products. For the tech-savvy board member, this may translate to a minor inconvenience. But no bank board is composed of a single tech-savvy member. Not only does navigating between apps waste valuable meeting time, learning to navigate within each individual app can significantly raise the learning curve. Making effective, informed, and unified decisions places bank boards at the mercy of their least tech-savvy members. They set the pace for how often boards need to pause for members to navigate to the right documents or features within their board portal. They also dictate how long those pauses last. In a meeting where every second counts, those pauses begin to add up; fast! When the future of your bank relies on board decision-making and your board relies on technology in order to execute on its priorities, why settle for less? Why settle for solutions that don’t allow your board to efficiently evaluate and effectively deliberate on the information and ideas they need to make the right decisions? 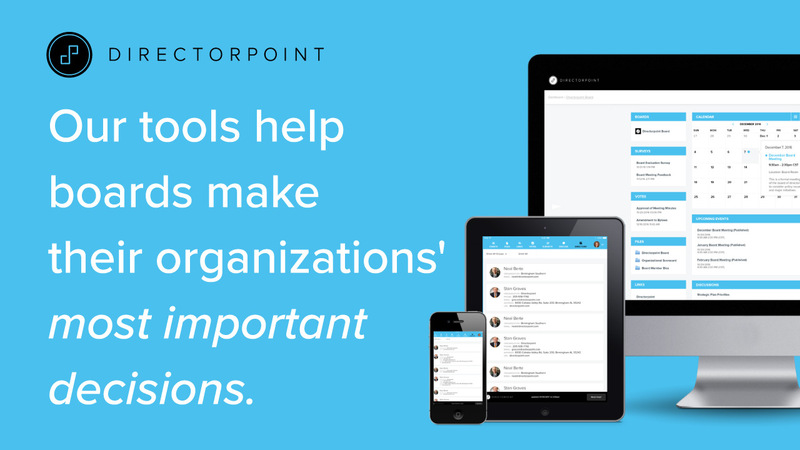 Investing in powerful, easy-to-use board software gives board members the features they need to focus on their priorities. 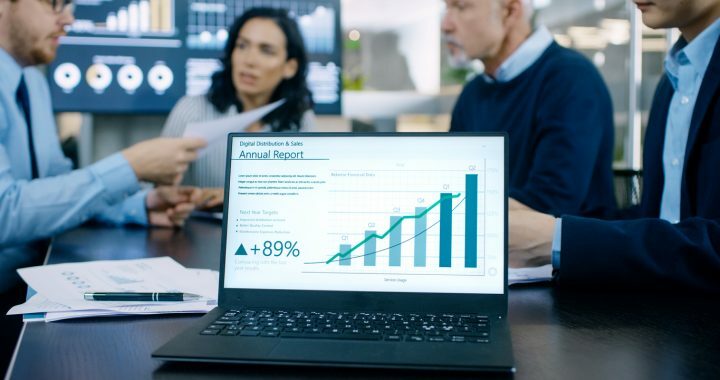 Investing in a board software whose features are contained within a single app allows bank boards to consolidate the learning curve so they can focus on their priorities without wasting precious meeting time.If you are in the market for an all-in-one board software solution, there’s one we’d recommend. Directorpoint is helping banks make better decisions across the board. Schedule your free software demo today or call (888) 492-7020 to speak with a board software specialist. Posted in Blog and tagged Bank Boards, Board Members, board portal, board portal app, board software, Technology.